I’ve cooked my entire adult life, often without a book. I was lucky to grow up around women who were whizzes in the kitchen and I learned from them without even realizing it. Whip up pudding from scratch? Absolutely! Fry a finger-lickin’ chicken? Sure, where’s the flour? Rustle up something from pretty much nothing? But, of course! You mean some people can’t do that???? So, I’m always perplexed when I hear, “Oh, I don’t cook. Not just for me. I live alone.” Good grief woman! If you’re not worth cooking for – then who is? I actually prefer dining alone sometimes, particularly on Fridays, when I’m fried by five (and people can’t see me eating that huge mound of noodles…) Also, if you’ve had a really bad week, all that chopping can be downright therapeutic. Take THAT, Mr. Onionhead! P.S. A good pasta sauce is as easy as opening a jar of Barilla, adding garlic, a bit of olive oil and some red wine. Let simmer for about ½ hour while you have that first glass of vino and get the pasta water boiling. My friends and I also frequently and unapologetically serve this to each other. P.P.S. 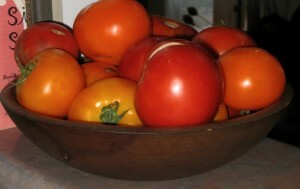 The photo is tomatoes from my garden last year. If there’s anything better than cooking tomatoes, it’s cooking tomatoes you’ve grown. I’m coming to your house for vacation. How much to stay in your guest room and let you cook for me, for…oh, a long weekend??? ?